The Uber and Lyft business model is becoming very popular in all countries around the world. In fact, there are loads of alternative systems to these companies, as is the case of Cabify or this Brazilian option called 99 POP - Ridesharing. 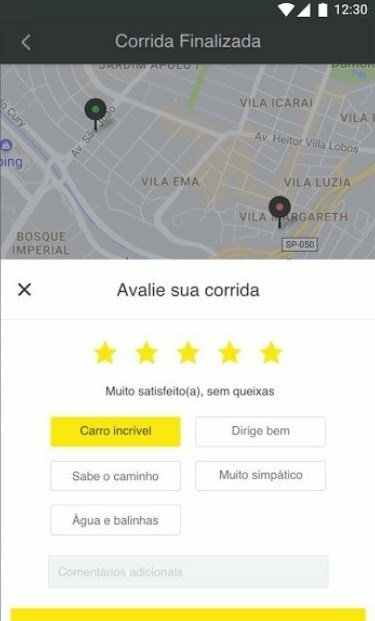 So if you live or are staying for a while in Rio de Janeiro, Sao Paulo, Porto Alegre, Salvador de Bahía or any other large city in Brazil, you can download this app for Android that you can use just as if it were a taxi application to order a private transport whenever you require a cheaper and more informal service. How it works is similar to other apps of the same nature: the app will locate you by means of your GPS and by simply tapping the screen you'll be able to order a car that will pick you up at your location. As easy as sharing your location with the application and waiting to be picked up. Choose a payment method: credit card, cash or PayPal. Use discount vouchers for better offers. View the location of your car in real-time. Find out how long you'll have to wait for your vehicle. Order a service knowing the approximate price beforehand. Contact the driver if necessary. Rate the driver's skills such as his knowledge, politeness or driving. With regard to other aspects such as safety, all drivers in the application have been duly registered as well as their vehicles, in order to guarantee the comfort of the passengers.